I'm sure I'm supposed to find this unattractive.. but it supports Newcastle and has a smiley face so instead I find it quite endearing. 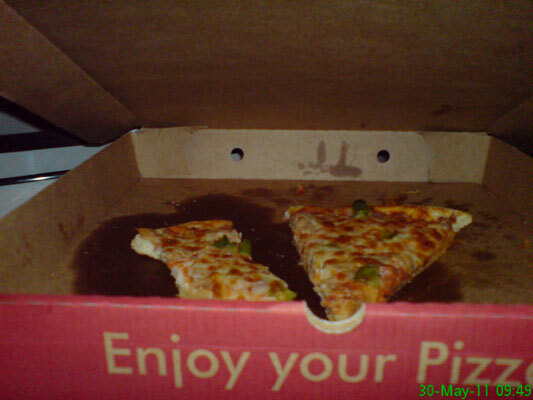 Leftover pizza for breakfast. Delicious. 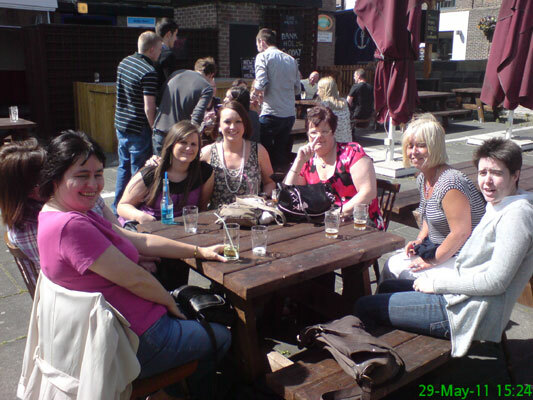 Linda, Claire, Rachel, Becky, Audrey, Marie & Sara sitting outside in the sun during our day out in Durham for Becky's 21st birthday. 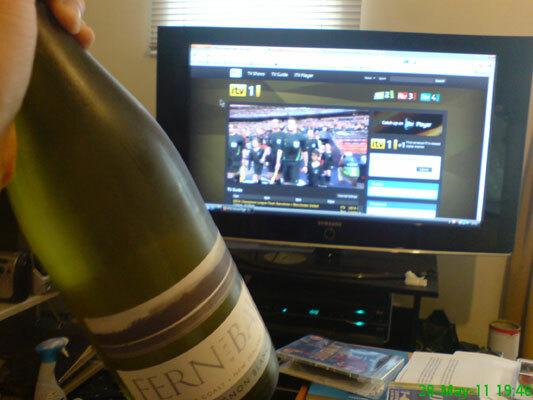 I've been looking forward to this wine all week. Unfortunately due to the aforementioned laptop screen breakage I'm forced to watch on ITV.com so that I can still browse the internet occasionally during the match. 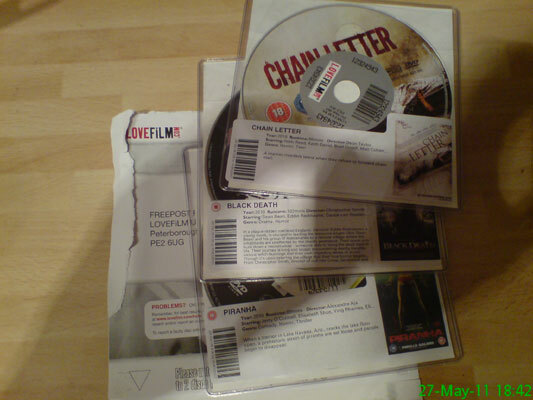 As a treat for being with Lovefilm for 4 years I received 3 discs instead of 2. I watched Chain Letter, which was absolutely terrible, but I just love a crappy horror on a Friday night. 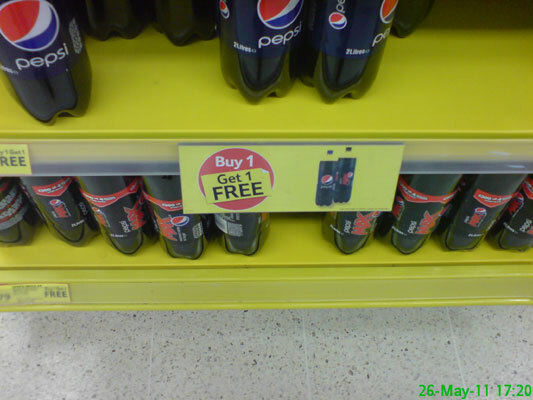 Pepsi Max. Buy one get one free. A fine end to quite a poor day. 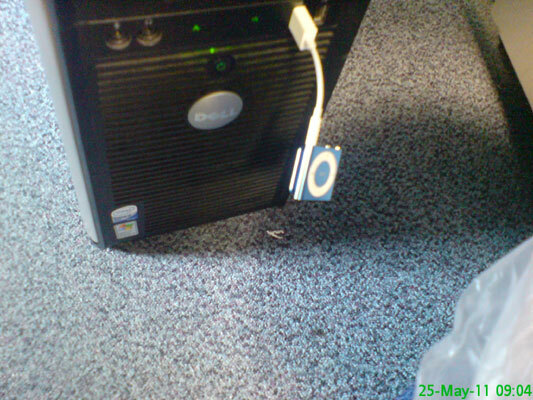 A quick charge of my iPod in preparation for the gym later. Tonight's tea, looking disturbingly like something a dog would eat. 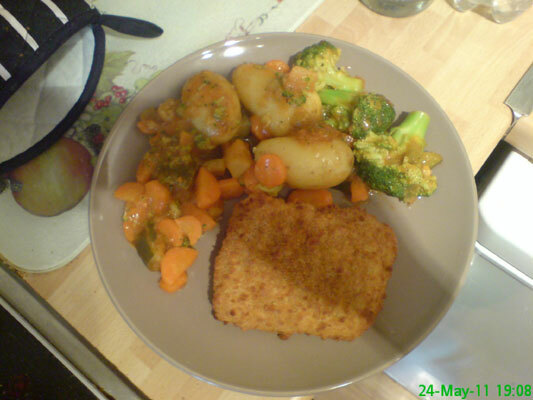 "Chunky" cod fillet, potatoes, carrot, broccoli & ratatouille. 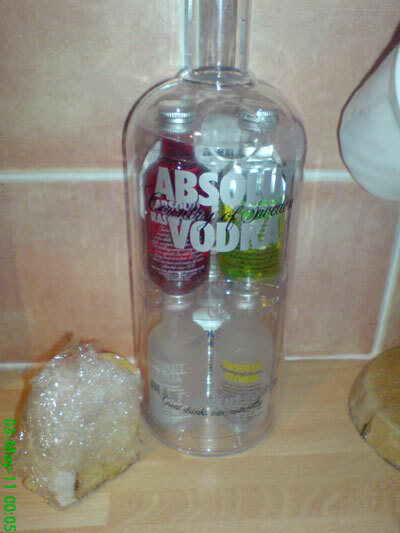 All sloshed together. It tasted okay! I stood on an upturned plug and cut my toe. I am aware my feet are manky - a combination of newish socks and a trip to the gym. My last game in Level 7 as it's becoming an extended family section and I don't want to have to borrow a child to go to the match. It'll be weird next season sitting lower down after being so high up since 2001. 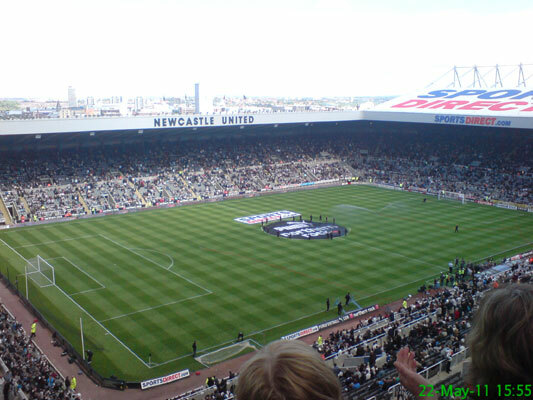 Newcastle threw away a 3-0 lead to draw 3-3 with West Brom. 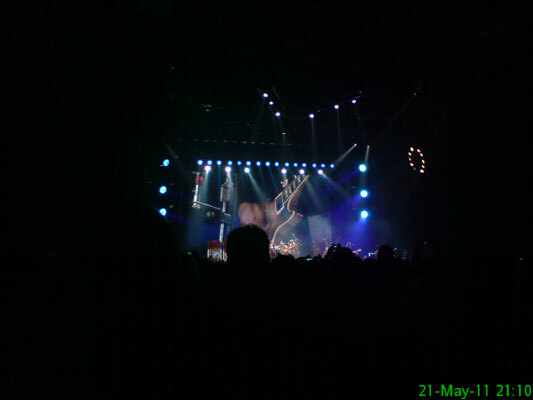 I went to see Rush at the Arena. 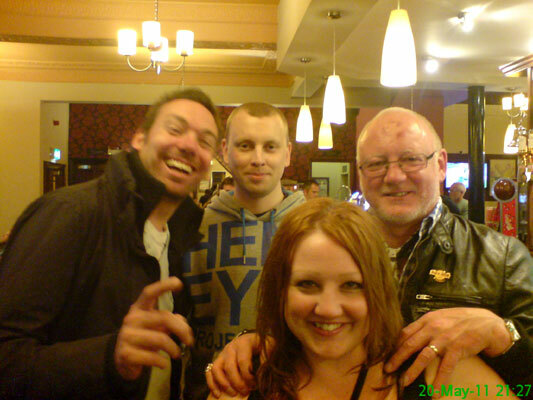 Friday night in the Newton with Stu, Graham, Ali & Dad. Payday. Instead of buying a load of expensive gear I buy some cheap shorts and a belt. Just like every other month, this time round I'm going to try and keep spending to a minimum.. 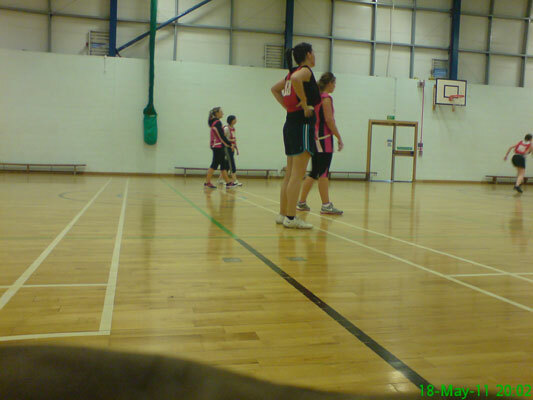 I played netball with my work team and this was the game just before ours. We lost, unfortunately. 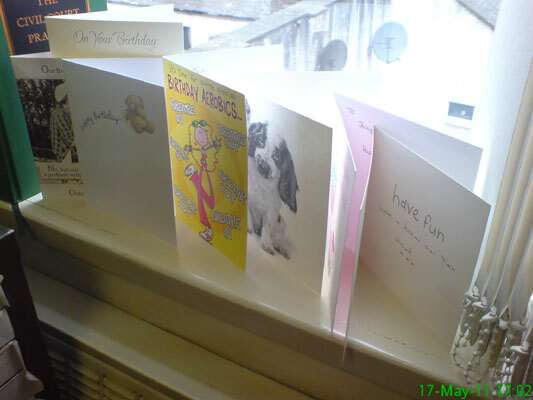 Some of the cards Jen received for her birthday, arranged carefully next to some law books. 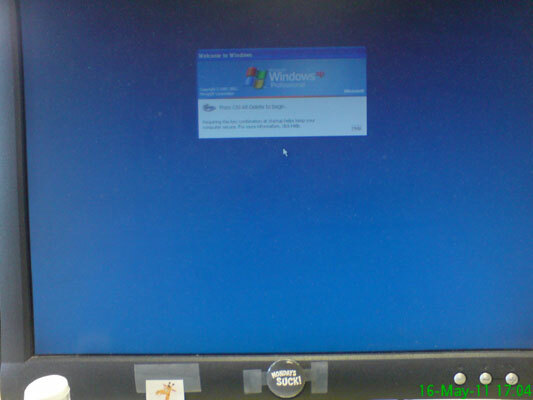 After having to restart my work computer earlier in the day, 5pm arrives and I accidentally restart again rather than shutting down. Finally it gets back to the login screen so I can get the hell out. Nothing good can come from being at the casino until around 5am. Except banter and meetings with random Scottish men (hello Stonehouse). This photo shows people trying and failing to win on Wheel of Fortune. Went to Nasser's new place for a barbecue. 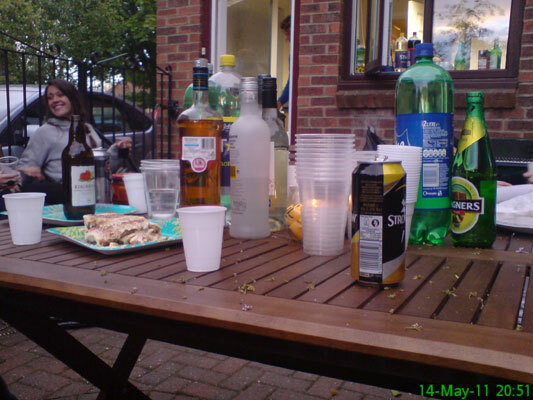 This was some of the drink & tiramisu on offer. 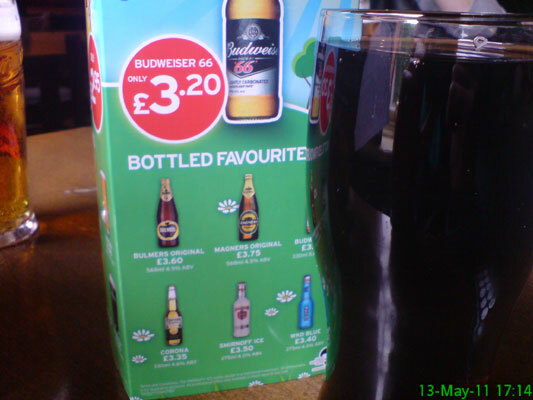 Call me old fashioned, but £3.20 for a bottle of beer is obscene. 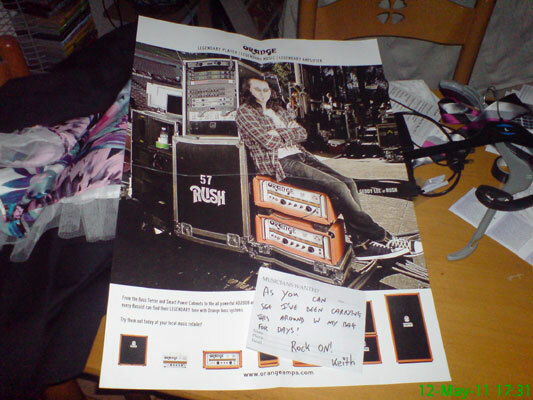 A present which arrived in the post from Keith. Geddy is the frontman of the awesome band Rush and I am possibly their only fan (at least the only one under the age of 50). 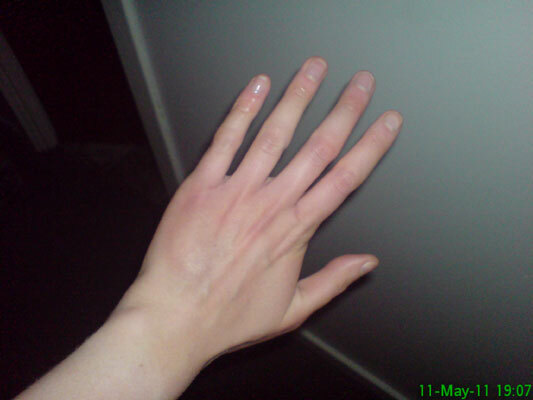 It's not a great photo but this is supposed to show the large bruise/lump that has formed on the left side of my hand following a netball related incident yesterday. 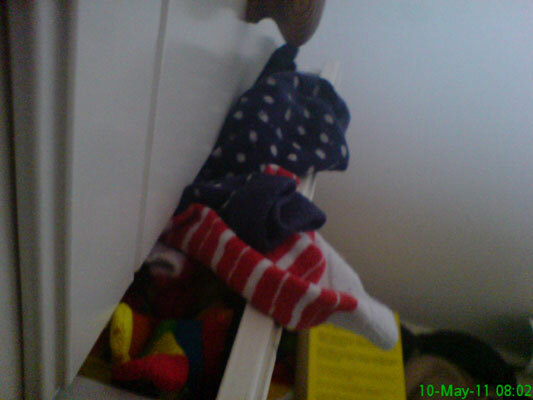 My sock drawer is overflowing - I think it's time to throw some old ones away, I just can't bring myself to do it. 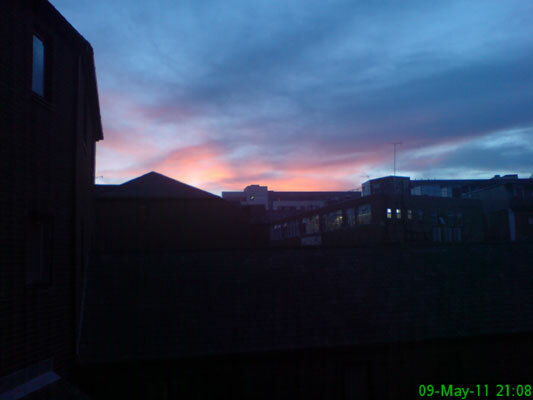 The sky looked particuarly pretty tonight. A perfect way to round off the weekend. 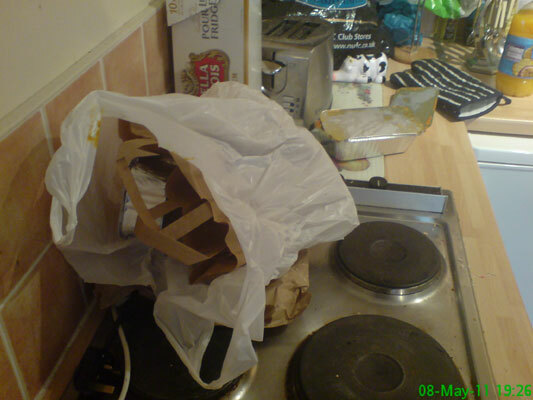 Shame a takeaway always creates so much mess. 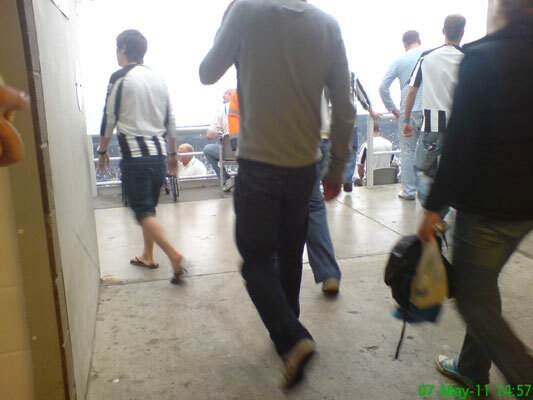 Everyone heads out to the seats to watch the match. 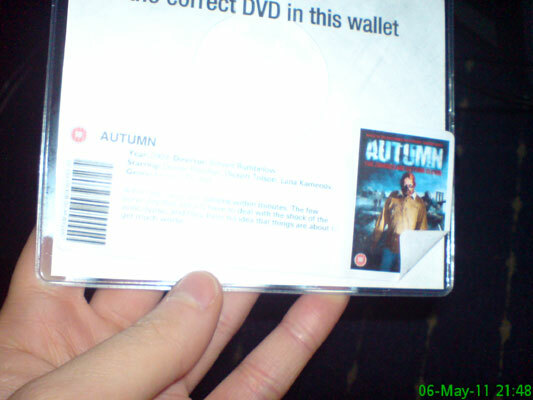 This evening's film choice - a terrible zombie flick called Autumn. 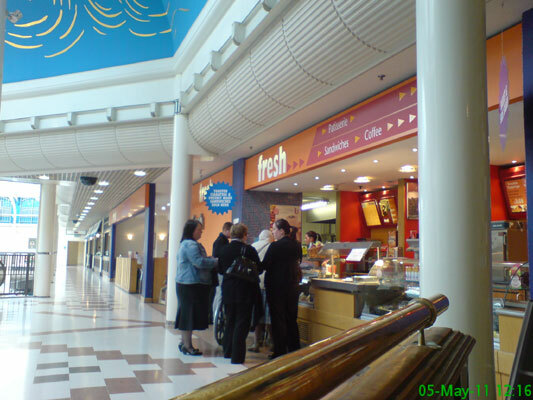 The place in Monument Mall where I went for lunch with my Mam & Gran. Nothing too exciting, just a quick and easy bite. 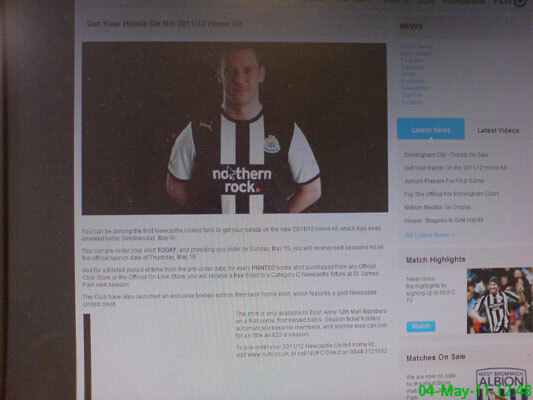 Newcastle club captain Kevin Nolan models the new home shirt. The flavoured vodka I received from Ali & Stu as a gift for being a witness at their wedding, and also some of their delicious lemon wedding cake. 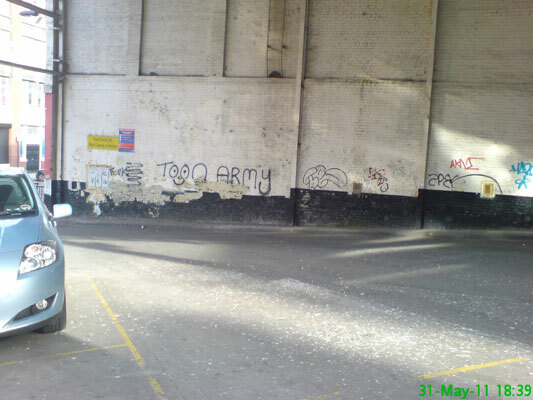 Bank Holiday Monday and I awoke to the news that US Forces had killed Osama bin Laden. 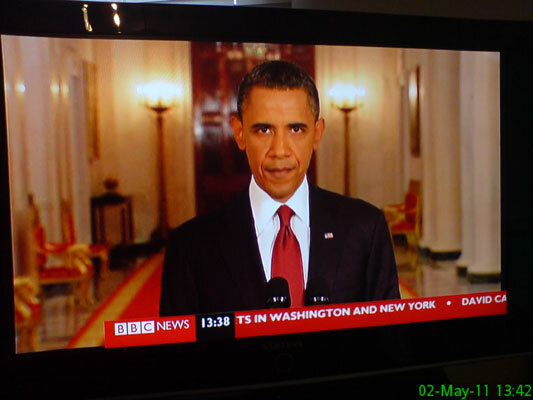 Throughout the day clips of President Obama's statement were repeated. I promise tomorrow will not be a picture of my TV screen. Due to a recent incident of rage, my laptop currently has a broken screen. 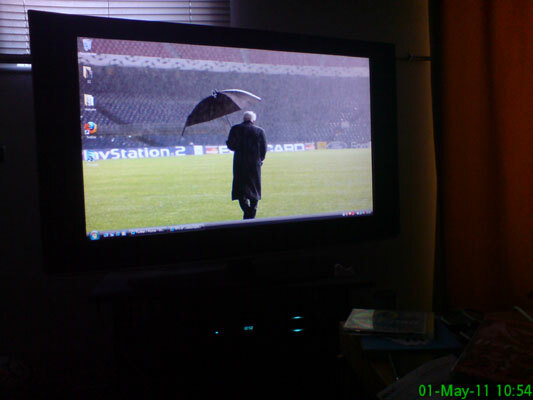 Not to worry though, I managed to get it hooked up to the TV so I could have a lazy Sunday browsing the web.